We are often told to go with the flow. To take things in stride. To not let anything upset our apple cart. But what if going with the flow is hurting us? What if we need to still accept things as they are…but choose to take responsibility and go for what we want anyway? There are times to let things be. And there are times to let things be and still take action. Seth Godin’s words can be viewed as harsh, or they can be viewed as a call to action. 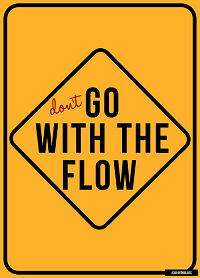 I’ve witnessed clients, colleagues, friends, and loved ones claim they were going with the flow. And I’ve witnessed them not achieve their goals because they’re choice to flow seemed to, at least in their minds, relieve them of the need to do anything to further their cause and go for their dreams. And I’ve witnessed clients, colleagues, friends, and loved ones who also accept that things are as they are, and then take small (and not so small) steps against the flow each day. And I’ve watched them soar. I’ve written a memoir and I’m shopping it for publishing. So far, it’s a long haul. At times I’ve been tempted to give up. I think I’m justified. I’ve been told it’s near to impossible to get this thing published. I could simply state that I’m going with the flow. Instead I’ve chosen to know that I need to be patient. I’ve accepted what is; and I’m taking action to make my dream come true. Where are you going with the flow…and it’s causing you to fail? See the flow. Go where you want to. How has going with the flow helped you? How has it hurt? For support in causing your own flow, contact Lisa at lkohn@chatsworthconsulting.com.